The 400BBL mud purification system was sent to the Australian drilling company. Recently, the 400BBL mud purification system customized for the Australian customers has completed the production and commissioning work. The 400BBL mud purification system designed and manufactured by GN Solid Control is designed according to the actual needs of customers. In the design process and equipment configuration of this set of 400BBL mud purification system, the cost and treatment effect are taken into consideration, and the Australian acceptance criteria required by the customer are realized. The customer’s acceptance of the factory has been well received by the customer. The configuration of the 400BBL mud purification system produced by GN Solid Control mainly includes two sets of Shale shaker, one jet mixing device, two mud mixers and one mud tank. The mud vibrating screen produced by our company can be produced according to the depth of the customer’s on-site drilling rig. The model ordered by this customer is GNZS703E-HB type mud vibrating screen. The mud vibrating screen produced by GN Solid Control is efficient at the site. The separation capability enables efficient recovery of useful drilling fluids. The jet mixing device ordered by this Australian customer is mainly used for on-site configuration and weighting drilling, changing drilling fluid density, viscosity, water loss, etc. The jet mixing funnel is designed according to the Venturi principle. The customer orders the mud mixing on the mud tank. The device is mainly used to maintain the uniformity of the drilling fluid and suspend the solid phase particles, and continuously and reliably mix and mix the drilling fluid in the field. Mud tanks are used to transfer and store mud. GN Solid Control has many years of experience in design and production of mud purification systems. It has been widely used in China, Australia, Middle East, Southeast Asia, Africa and other regions. It adapts to various working conditions and adapts to various types of drilling rigs. System, our company has accumulated rich experience in mud system design, configuration and production. Many customers are working together with GN Solid Control. GN Solid Control attaches great importance to product on-site commissioning and after-sales. GN Solid Control’s after-sales team will provide on-site guidance installation and operation training. Sales personnel will also regularly visit customers, communicate problems encountered at the scene, and provide remote support. GN Solid Control rich production experience and case accumulation, perfect after-sales service, is the customer’s first choice! As the crude oil market is down, we get more business from trenchless client. More and more sets of customized mud system export to MENA region. One client is from North Africa region, they have rich experience in American Augers drilling rig & mud system operation. And now, they are searching for more cost-effective mud system for their HDD operation. They find GN and ask for quotation and mud system drawing for 1000gpm. As the client only like the MCR-10000 mud system design from America Augers, we offer the similar mud system GNMS-1000GXL mud system. 3sets of shale shaker: GNZS703E-HB shaker. Each shaker model has treating capacity 500gpm. And 3sets of shaker can reach up to 1500gpm. As the client’s request, they will use two of them, and one of them as backup. 2sets of mud cleaner: GNZJ703E-2S12N. Each mud cleaner have treating capacity 1000gpm. And 2sets of mud cleaner can reach up to 1000gpm. As the client’s request, they will use one of them for operation, the other one as backup. 3sets of centrifugal pump; two pump for feeding the cyclones in mud cleaner, and one pump for mixing hopper. 1set mixing hopper for mixing bentonite or barite. trailer mounted mud tank with eight tyre for easy movement from site to site. Another client from Middle East region has a smaller project, and need 100-150gpm mud system. The mud system is compact design with much cost effective equipment list, including double deck mud cleaner with coarse mesh screen, and four cyclones. The mud cleaner can remove +40microns solids particles. After mud cleaner, the clean mud will go to clean tank directly, and where bentonite or barite may also mixing there. One mud hopper and mixing pump also attached. If you have some HDD project and need mud system, pls contact us freely. Small water well rig may no need mud system, just requiring drill rig and mud pump. But for deep water well drilling, mud system is also necessary to get better drilling performance, and give better project to the drill rig bit and mud pump. 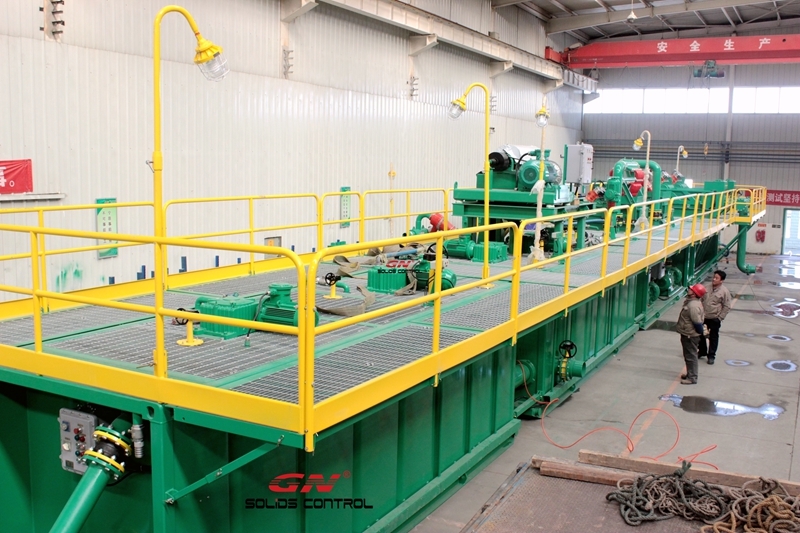 GN Solids Control mainly focus on oil drilling mud system. And we also have some client from water well drilling project, get mud system from GN; For example, client from Niger, they have 100 water wells project to improve the local life quality, and they bought the rig fro Italy Drillmec brand, and have mud system from GN. 1) 1ea shale shaker GNZS703. GN Solids own patent shale shaker with 3 panel can give good performance, reliable working for the mud treatment, and we can offer coarse steel screen with much longer lifetime to fit for the system. 2) 1ea mud cleaner GNZJ703-1S8N. This unit is combination of 1ea shaker, 1ea desander cones and 8ea desilter cones. Mud cleaner, Small footprint, and 2nd and 3nd phase treatment, to remove most solids above 30microns. 3) 1ea mud hopper, the mud hopper is necessary to mix the chemicals and adjust the gravity of drilling fluids. 4) 3ea centrifugal pump. 2ea centrifugal pump is used for feeding the mud cleaner, desander cones and desilter cones. 1ea centrifugal pump working with mud hopper, to give power for mixing the chemicals. 5) 1ea mud tank to support all above mentioned solids control equipment. The mud tank is same size with container, can be locked on trailer, guarantee on the safety during transportation. 6) 1ea submersible slurry pump, this is option. The client can buy from GN the slurry pump for feeding the mud system, and even the hose to connect the slurry pump to the mud system. Water well drilling company is very popular in Desert area or other water shortage areas, like Middle East, Africa, Mongolia etc. Water well drilling company usually works for government civil engineering projects, and requiring water well drilling rig, mud system, generator, etc. to bid for the water well drilling project. There are also some water well drilling along with oil drilling company, to supply water to the oil drilling operations. GN Solids Control is China leading manufacturer for solids control mud system. We have rich experience in mud system production, operation, commissioning and maintenance. Recently, we have one client from Africa who just bought one set 500gpm mud system from GN. Pls see below project informations. 1 set mud tank, size smaller than 40GP container for easier shipment. 1 set shale shaker, GNZS703 3 panel shale shaker for better performance. 1 set mud cleaner, GNZJ703-1S8N, with 1ea deck shaker, 1ea desander cyclones and 8ea desilter cyclones. 2 sets centrifugal pump for feeding the desander and desilter cyclones. 1 set mud agitator is equipped in third compartment to mixing the mud to avoid settlement. 1 set mixing hopper and 1 set mixing pump for chemical adding function. 1 set generator to power the mud system unit. After GN mud system arrived at client’s jobsite, we arrange interpreter and engineer to the jobsite to help for the installation and commissioning. With GN mud system, the waste slurry can be recycled and reuse, this reduce the cost on chemicals and mud in large degree, and the clean mud guarantee on the drill bit lifetime, help the smooth going project. 1) Industry centrifuges: 9inch bowl centrifuge, 14inch bowl centrifuge, 18inch bowl centrifuge, 22inch bowl centrifuge etc. 2) drilling waste management: vertical cuttings dryer, solidification unit, thermal desorption unit, etc. 3) various model shaker screens.